A couple weeks ago I watched Gone Girl, which I was super excited about because I had read the book a few years prior. So when I stumbled across these Amazing Amy illustrations, I thought they were the cutest things ever. It's a reference you'd get if you're familiar with either the book or film. Deep burgundy tones for lipsticks are definitely on my list this season. But when it comes to your nails, I'm really diggin' gray nail colors like this Dior nail lacquer in Junon 494. I'd also love it with a matte finish too. A month ago I was into curly hairstyles, but right now I'm feeling partial toward a more ombre wavy short hairstyle look, a la Ciara from a couple years back. Her hair game is killer! Will probably do this to my hair in November. It's funny because people are wearing this style now, but I feel like Ciara did it first. Am I wrong? So I'm well aware that this Lady Gaga Fame eau de parfum is nothing new, but I'm really loving it this month. It's more of a fruity scent with belladonna, tiger orchid, apricot and honey. What I love most about it is the black fluid that becomes invisible when airborne, and the bottling that's too cute to pass up. I don't really listen to the verses in Tove Lo's Habits, which might sound weird, but I only really love the chorus. I find myself singing the lyrics of the chorus over and over again at random moments throughout the day. 1. OK we’re talking coffee – what’s your favorite seasonal drink? My favorite coffee drink is a tall, nonfat, iced caramel latte. I wouldn't even call it seasonal because I order it all year. But since it's getting cooler out, I'd opt for it hot with foam, of course. 2. Accessories – what do you opt for: scarf, boots, gloves? I listen to my usual playlists in the fall and in the winter too. But I do like to add a few seasonal selections once we get to November/December. A few carols here and there. 4. Perfume – what’s your favorite scent for this time of year? I want to go with a spicy scent since it's autumn, but I'm actually quite into Lady Gaga's Fame perfume--an oldie, but a goodie. See it above. This monogrammed votive candle from C. Wonder that I got a few months ago and I'm still loving today. I believe it's the garden scent of vanilla, musk and floral notes, and it's super cute that it's personalized too. I love the feeling of autumn--that whole cool breeze, sun haze, crisp air thing. I like how autumn feels snuggly and comforting. I'm trying to wear a lot more lipsticks in autumn, preferably dark shades like plums and burgundies. I think these colors work best for my skin tone so it's perfect that they fit so well with the season. I am looking forward to football season and holiday vacations. Even if I stay in the Bay over the holidays, I still really enjoy being able to spend time at home with friends and family. Do you ever feel like when you were born, everyone got the handbook to life but you? Ok, maybe not. But when it comes to style, there is no official handbook... but that doesn't mean we all have to wander around clueless. This week is your guide to style, so pull up a chair, take a deep breath and realize, everything is going to be just fine. Answer any of these questions & tell me what you're loving in the comments below--I tag everyone! I love all this and yes Ciara did it first of course and her hair game is really a KILLER! I really love Tove Lo for a while, I'm glad she's making it to the mainstream now. :) That Dior colour is elegant. Congrats on making LAM. I'm into burgundy for lips and grays for nails for fall as well. And I can't seem to get enough of my Diptyque Baies candle lately. I love grey nails too! Especially shades with purple undertones. Congrats on the IFB feature! oh my, I love the gray nail polish, and I am having my nails done tomorrow so I think I will ask for that color - thanks for the inspiration. I too am getting my nails done tomorrow, and wasn't sure what I wanted. I have a super dark purple now, but I think I'll go for grey. That's a great one! Congrats on being featured! I was instantly drawn to Ciara's hair and seriously, her hair is amazing, It reminds me of how Gisele and even Madonna rocked ombre a few years ago. Great round up! 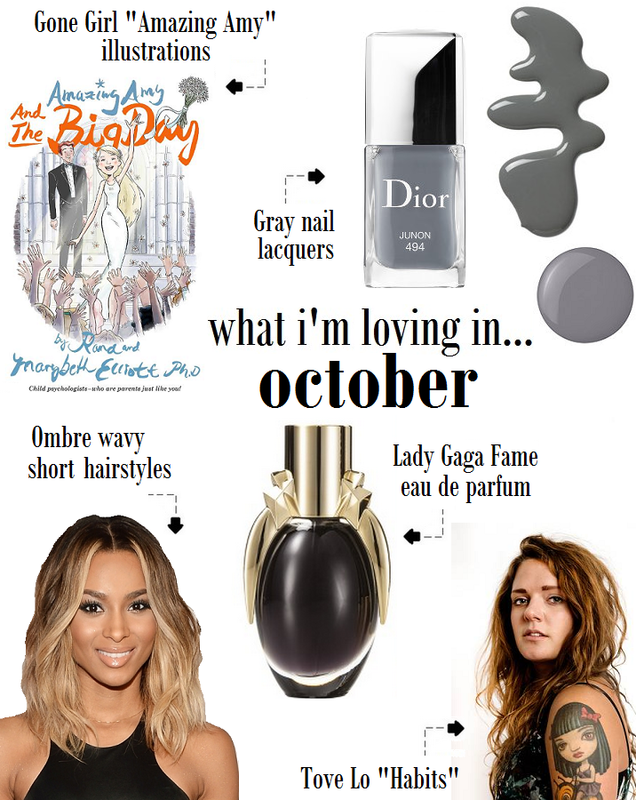 Love Lady Gaga's Fame perfume and gray nail polish. Check out Julep's Erin. I got in my box this month and loved it.